In the XVIII century there were two movements that marked history and which were very important antecedents for the independence. In first place, the United States became independent from England in 1776, opening the way and giving this idea to other colonies such as Venezuela. In second place, in 1789, the French Revolution, with its proclamation of freedom, equality and fraternity, carried an antecedent that had great impact among all intellectuals who saw that the existing regime in Venezuela was not adjusting to those ideals that were becoming in fashion. In Venezuela, the “Creoles” were angered by certain regulations imposed by the Spaniards, as later expressed by Simón Bolívar in his letter of Jamaica: “…with startling restrictions, such as the prohibition of the cultivation of fruits from Europe, the obstruction of productions monopolized by the king, the impediment of factories that the very Peninsula did not have, exclusive privileges on trade even on products of essential need; obstacles between provinces and American provinces so that they would not deal, understand, nor negotiate with each other. In addition to these reasons, the drop that spilled the glass was that the French, under the command of Napoleón Bonaparte had invaded Spain, forcing King Carlos IV and his son Fernando VII to resign to the throne in favor of Napoleón, who assigned his brother, Jose Bonaparte, as King of Spain. The Independence of Venezuela began in Caracas on the 19 of April 1810, when a group of Creoles from Caracas took advantage of the excuse that a French was ruling in Spain, to hold a town meeting and proclaim a self-government until Fernando VII returned to Spain’s throne. Captain General, Vicente Emparan, disagreed with this and when he asked the people gathered at the main square (today known as Plaza Bolívar) if they wanted for him to continue ruling, priest José Cortés Madariaga, made signs for the crowd to reply "NO". And that was what had happened. Emparan then said he neither wanted to rule; next he resigned and went to Spain with his colleagues. There the independence of Venezuela began. In addition, the Supreme Board addressed all of America for them to follow the "example that Caracas set", uniting to this movement. Elections were called for the month of November, in order to elect the representatives to the first congress of Venezuela, which was installed on the 2 of March 1811 with the elected parliamentarians of 7 provinces: Caracas, Barinas, Cumana, Barcelona, Margarita, Merida and Trujillo. Note that the provinces of Guayana, Maracaibo and Coro did not attend to this, remaining faithful to the Spanish government. This was the congress that adopted for the first time the flag of Venezuela, using the same introduced by Francisco de Miranda during his expedition in 1806, adding on the blue strip seven stars, one representing each province. 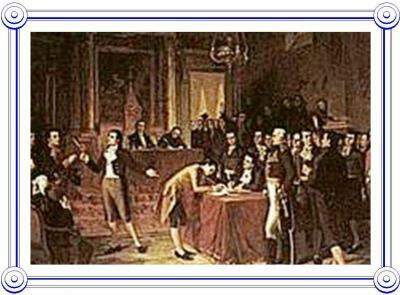 On the 5 of Julio 1811, the members of the Patriotic Society, convinced all the congresspersons except one, to declare the independence of Venezuela, forgetting for once and all the defense of the rights of Fernando VII. 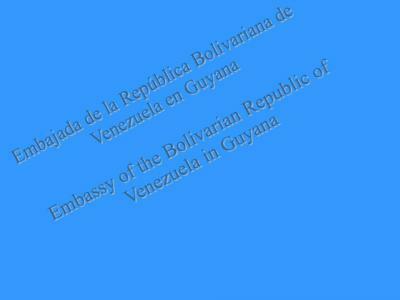 This marked the foundation of the Venezuelan State. The act of independence was entrusted to Juan Germán Roscio and the definitive text was approved on the 7 of July.